The Parish of St Vedast is known from the 12th century, and the church is traditionally claimed to have been established by 1170. It has been altered, enlarged and restored many times and probably rebuilt at least twice, the last time by Christopher Wren, after the Great Fire of London in 1666. Having been completely burnt out during the Blitz of World War II, the church was restored under the direction of its Rector, Canon Mortlock, and a very influential Parochial Church Council that included Poet Laureate John Betjeman and master organ builder, Noel Mander. The church is dedicated to a French saint, little known in Britain, who was Bishop of Arras in northern Gaul around the turn of the 6th century. 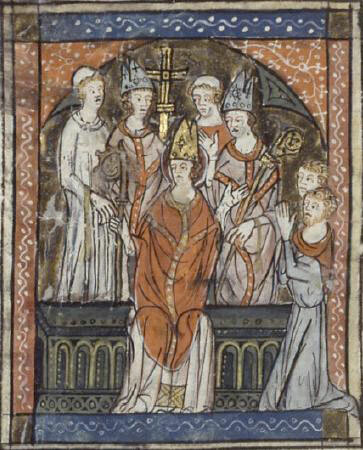 Vedast, who was called in Latin, Vedastus; in Norman, Vaast; in Walloon, Waast; and in French, Gast on, helped to restore the Christian Church in the region after decades of destruction by invading tribes during the late Roman empire and to convert Clovis, the Frankish king. Remembered for his charity, meekness and patience, he is buried at Arras cathedral. His name in England has been corrupted from St Vaast, by way of Vastes, Fastes, Faster, Fauster and Forster to Foster, the name of the lane at the front of the church, and the reason that the official designation of the church is St Vedast-alias-Foster. St Vedast was venerated in particular by the Augustinian priors in the 12th century, and they may be responsible for the foundation of the few churches dedicated to him. Only one other church in England is currently dedicated to St Vedast, in Tathwell, Lincolnshire, a third parish in Norwich now being remembered only in a street name. Some of the works and legends of St Vedast are celebrated in the stained glass windows of the church. It has been suggested that the original church of St Vedast may have been founded by the Flemish community in London in the 12th or 13th century, possibly by a Flemish ancestor of Ralph d’Arras, who was the Sheriff of London in 1276. The first church was probably quite small, but additions were made through the centuries. A chapel dedicated to St Dunstan was added in the 15th century, and other altars were added in the 16th century to Mary and to St Nicholas. By 1603, Stow in his Survey of London described St Vedast as ‘a fair church, lately rebuilt’. Although no complete or accurate account survives for this early church, evidence of its construction can still be seen in the south wall of the church externally. Evidence of earlier openings for doors and windows, as well as the medieval stonework has been examined by archaeological survey and reported in London Archaeologist. In 1614, St Vedast was enlarged by 20 feet thanks to a gift from the adjacent Saddlers’ company, and ‘beautified’ according to Stow’s Survey. In 1635 the then Rector, James Batty, petitioned the Archbishop that a rail might be set up around the communion table as there are many “disorders and undecencies” among the parishioners when receiving the Blessed Sacrament. For his loyalty to King Charles I, Batty was “sequestered, plundered, forced to flee, and died” in 1642. How the church may have suffered during the Civil Wars of the mid 17th century is unrecorded, but given that the Parliamentarians kept horses stabled in the chancel of nearby St Paul’s Cathedral, it is likely to have been badly affected. The current Rectors’ Board lists the years between 1643 and 1661 as under Foulke Bellers, a ‘Commonwealth Intruder’. y the 1690s, however, structural flaws must have become significant enough that rebuilding was begun. Records of those responsible for the detailed design and construction of the church are somewhat sketchy. Other than Wren, it is possible that Robert Hooke and/or Nicholas Hawksmoor were involved (the steeple is said to be particularly Hawksmoor-like), and master mason Edward Strong had been paid £3106:14:7 by the time the church was completed in 1699. He was responsible for the cherubs that grace the west front and bell tower, and for the dove in glory sculpture now situated at the east end of the south aisle. Many of the minor changes that affected the church through the 18th century may not have been recorded, but we know that an organ was installed in 1773, and that heating was first introduced in 1790 – open stoves that were to be replaced in 1807 by a more satisfactory double fronted one. Thomas Pelham Dale, Rector from 1847 to 1882, fell foul of the Public Worship Regulations Act of 1874 and was prosecuted for “ritualistic practices”. Although he gave up the practices in question for a time, he was brought before a court in 1880 and, for contempt, sent to Holloway prison. The greatest change to the building in the 19th century was perhaps to the fenestration. A square headed window was removed in 1848 from the east end, along with the Dove in Glory sculpture by Strong above it. Twelve new stained glass windows were introduced in 1884, making the church much darker. Internal adjustments to pews, screens, pulpit and altar rails were made shortly afterwards. On 29th December 1940, London was attacked by German air raids that dropped some 24,000 high explosive bombs and 100,000 incendiaries, mostly in the City. Although the Cathedral itself survived thanks to hundreds of volunteer firefighters, much of the area around St Paul’s was utterly destroyed. As after the Great Fire of 1666, St Vedast was gutted and left a burnt out shell, with roof, pews, pulpit and fittings all ruined. As the structure of the church and its tower were deemed to be safe, plans to restore the church began in 1947. The work itself only started in 1953, under the auspices of its new Rector, Canon Mortlock, and the architect Stephen Dykes Bower. The post war Parochial Church Council that oversaw the work included Poet Laureate and conservation champion John Betjeman and the great organ builder Noel Mander. To make the church a more appropriate layout for smaller 20th century congregations, Dykes Bower introduced collegiate style seating, and screened off the south aisle. New false walls were constructed within the east and south walls to make the church more rectangular, enabling a strong black and white patterned terrazzo floor to be laid. The ceiling was constructed to a pattern near that of the Wren original and finished with gold leaf and aluminium, donated by the Worshipful Company of Goldsmiths. An adjacent plot along Foster Lane to the north, formerly the location of the Fountain pub, was purchased for the construction of a new Rectory, and a small secluded courtyard built between this Rectory and the former parish school (now the parish hall of St Vedast).